Dinner is ready | Do the twisted. Next time someone asks for a new recipe, tell them to pick up Kashi’s new GoLean Crisp! It’s delicious, healthy and real easy to make. There’s a good chance cereal has never been served at dinner parties. This one is worthy. when Kashi launched up here I thought it was one of the grocery chain’s “no-name” brands. Packaging & logo looks cheap and crappy. But that’s just my opinion. I tried one of their cereals a year or so ago and thought it tasted like cardboard. Based on your glowing review, can I get a money back guarantee if I don’t like it? I am getting tired of my Multigrain Cheerios and could use a change…what say you Sullivan? Will you give me my money back if I think this one is cardboard too? Do you believe in Kashi that much? I’m throwing down the gauntlet. The challenge has been put forth. Do you accept? Will you put your wallet where your review is? I worship Kashi. Every night before bed, I light a candle and eat a bowl to show my devotion. I firmly believe this one is a winner. So yes, I accept your offer. Put some pants on and buy a box. Let me and the world know what you think. My credibility is in your hands. May Kashi be with you. No I haven’t tried it yet, but your testimony just convinced me. 🙂 Their Honey Sunshine is another personal fave. Mmmm. The challenge is on! I’ve got about a quarter of a box of Multigrain Cheerios left…next week I’m buying Kashi Go Lean Crisp. Okay, you might have, kind of sort of, quite possibly may have won the bet. 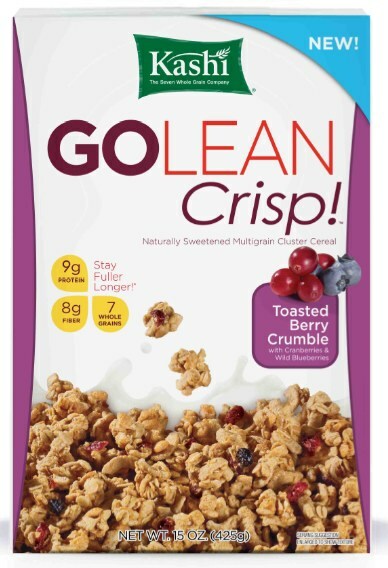 I wasn’t able to find the GoLean Crisp kind so I thought I’d give the Toasted Berry Crisp kind a go. I kind of sort of, quite possibly may have enjoyed it. Damn you Kashi! And while I’m at it damn you Sullivan! You may have won the battle, but the war is far from over! (muwahahahaha) I’ll see you on the ketchup battlefield next! Damn it! Damn it! Damn it! You won! I just looked at the picture in your post. It’s the same. That’s right, same same. My Toasted Berry Crisp is the same thing as your GoLean Crisp. It’s just labeled and packaged slightly differently here in Canada. I admit defeat…. Maybe you should even pose with it. In fact, I think that should be factored in with the bet. If you lose, you have to take a picture with the product. I’ll do it with Alymers, but I have a feeling Heinz will still be on top, so better start getting your ketchup pose ready too. Now if you’ll excuse me, I have a Kashi victory parade to attend. i’ve been searching for the perfect cereal for 26 years. i buy a new one every time i go to the grocery store. my search is now over. this is the best thing i have ever put in my mouth. done. and. done.